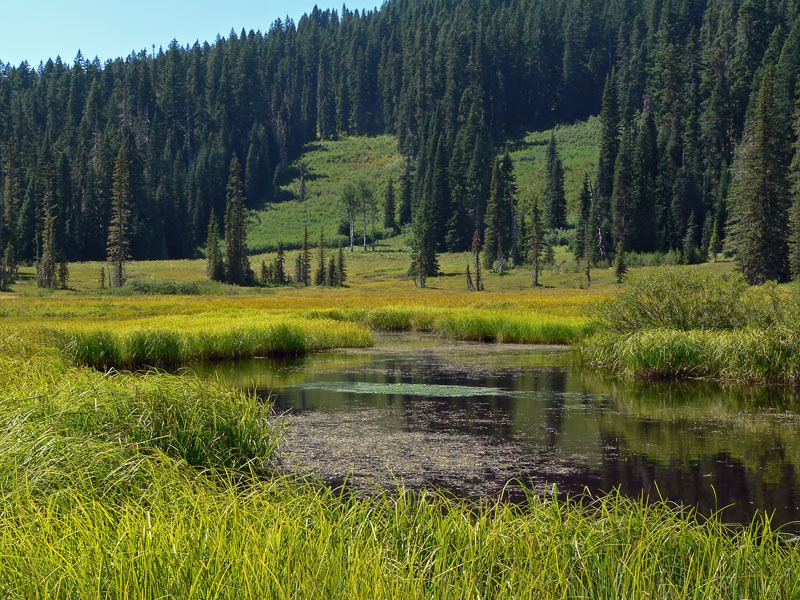 Quaking Aspen Swamp is a fantastic wetland with a long season of bloom and as many as 250 different plant species, including quite a number that are unusual for this area. A short trail through some pleasant forest passes the east edge, but to really explore the site, it is necessary to wander out into the wet meadows, taking care where you step, especially in the boggy areas where sundews abound. Rubber boots are a must until late summer. Take Hwy 126 east past Blue River and milepost 45. Turn right onto Road 19, The Aufderheide. Keeping right, follow 19 for 3.3 miles until you reach the Cougar Reservoir Dam. Turn left onto Rd. 1993 and cross the dam. Follow 1993 for 2.7 miles of pavement and another 9.3 miles of gravel to a trailhead on the right. The trail to the left goes downhill to Quaking Aspen Swamp (to the right goes to Lowder Mountain).